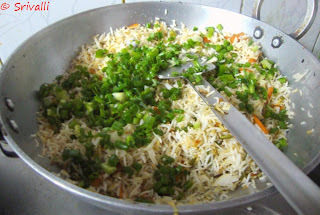 The mention of Chinese Fried Rice takes me down the memory lane. It was the early 90's that the Indian Culinary world was introduced to those tempting fusion dishes from the Chinese Cuisine. Take away packs of Chinese Fried Rice with Chop Sticks was a fad. That was also when most felt that eating out was fashion. Weekend night was dedicated to eating out Chinese. 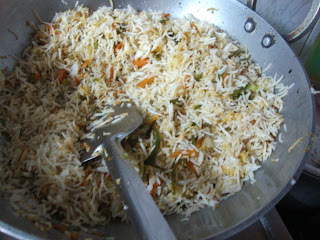 I think the invasion was through Egg Fried Rice, Chicken Fried Rice, before the Vegetable Fried Rice came into picture. There was really not much of a difference with the basic recipe being the same and you can just spice up the main ingredient and add them. With years passing, this become such an integral part of our restaurant menu that Chinese got dropped and Fried Rice became a standard item. As Cauliflower Manchurian is. Flip through any Restaurant and you will find Fried Rice, Chicken Fried Rice, Egg Fried Rice, Cauliflower Manchurian without fail. At our home these were regulars at least once a month. Needless to say Amma makes all these so very well. Somehow after my marriage these dishes took a back seat. Nevertheless they appear on table once in a while. Especially when we are entertaining guests. These dishes are also special for me, as these are few of the dishes that I end up making exclusively when cooking together with Amma. And this recipe is very much a chinese fried rice restaurant style with the smoky effect. Today's recipe was cooked many months ago, when parents had guests for dinner. I was called for making this Chicken Fried Rice and naturally I won't miss the opportunity of clicking away the pictures. But can you believe, I actually forget to take a final picture. So you got to do with seeing how it looked at the final stage on the Kadai. When I realized this, Amma said we can naturally cook it again and take a picture. I said that can wait but the post can't. Will surely update a final picture when I get around making it again. 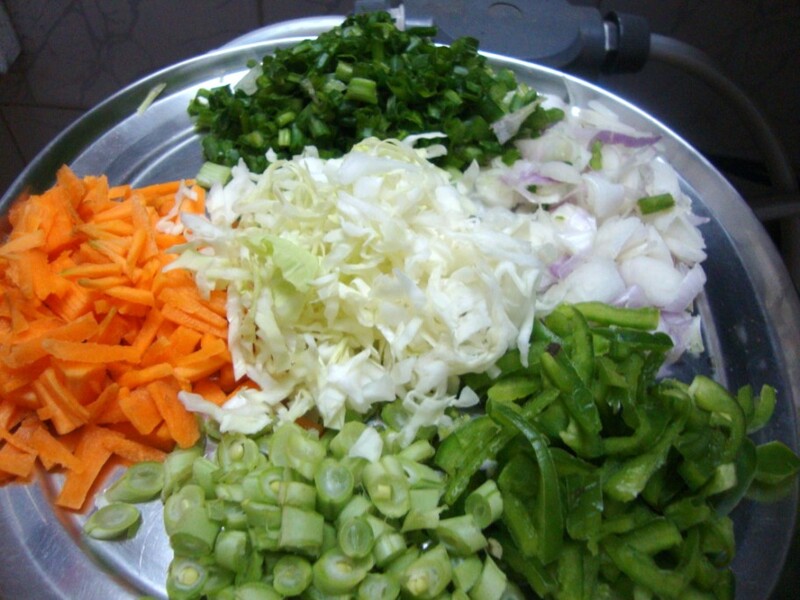 Get all the vegetables ready by chopping them into fine pieces. 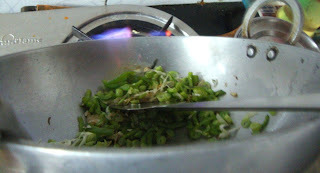 Heat a wok or a kadai with oil. Saute onions, cumin seeds. 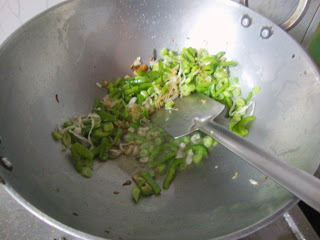 Once done, add the capsicum, saute till half done. Tilt the kadai to a side so that the oil along with vegetables reach the flame. This will make sure it gets the smoky effects. See how the vegetables catch flame and it lets out a good smoky smell. But ensure you are very careful with all vegetables not catching fire. Next goes the cabbage, beans. Add the soya sauce to the vegetables, salt and ajinomoto. Finally add the pepper and spring onion greens. 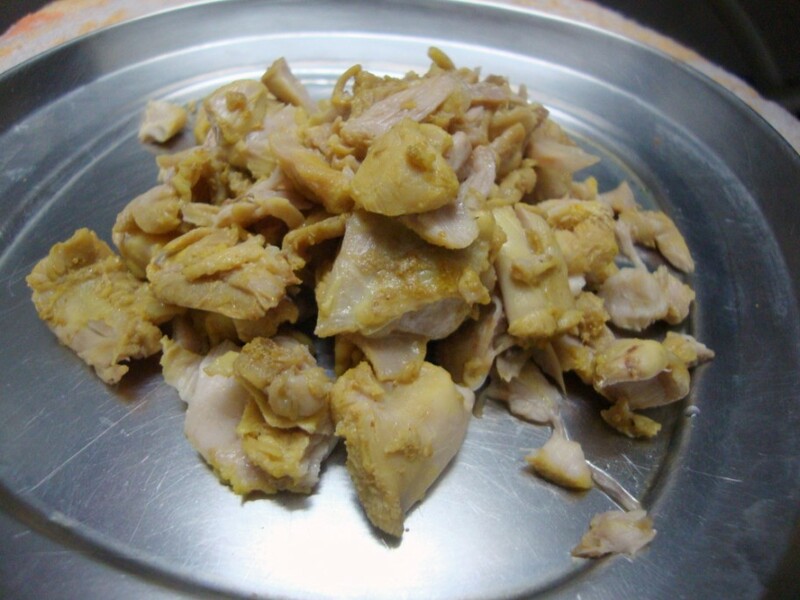 Meanwhile pressure cook the chicken as mentioned below and remove the bones from the chicken. Heat a pan with oil, saute the green chili sauce, then followed by the chicken pieces and pepper. Finally add the chicken pieces to the rice or remove the portion you want to add to the chicken and mix together. Clean and soak rice for 15 mins. Cook the rice in a non stick pan with 4 & 1/2 cups of water. Since the rice has to be non sticky and separate, you can even reduce quarter cup of water. You can either pressure cook or cook directly on stove. Once its cooked, remove and spread it on a plate so that you have each grain separate. 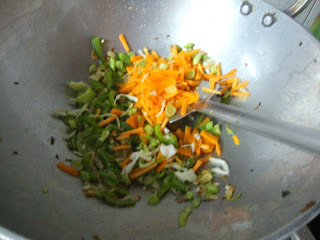 Chop all vegetables finely. Onion bulbs can be chopped as circles. 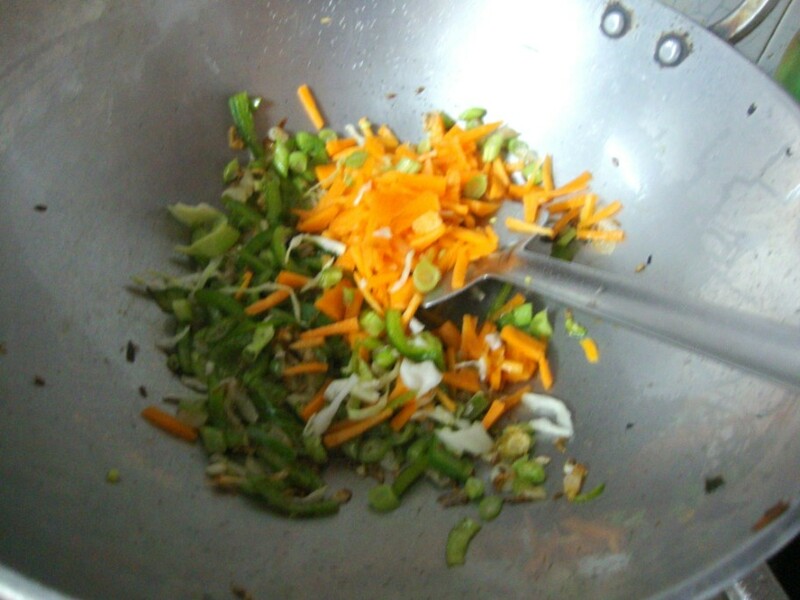 The stock is saved to be used for garnish at the final stage. Rest of the vegetables can be chopped finely. 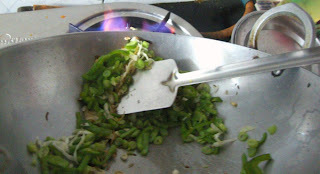 Heat a wok or Kadai. Wok works out best as you an flip the vegetables to come directly in touch with flame, which brings out the characteristic smoky effect. Add 2 tbsp of Oil, to this add cumin seeds. When it splutters, add chopped spring onions. 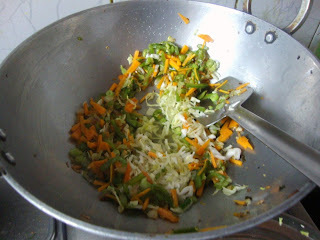 Fry well, then add all the chopped vegetables. Sauté well with the flame high. To get the smoky restaurant effect, tilt the kadai to a side and let the vegetables catch the flames. The moment the vegetable in oil gets burnt you can smell the charred or smoky smell. Tilt it back and keep sautéing till the vegetables are crisp and cooked. This dish requires the vegetables to be crisp and not over cooked. Then add Ajinomoto, salt and Soya sauce. Sauté well. 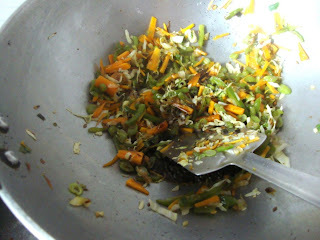 Slowly add the cooked rice and mix well. Add the pepper powder and adjust the salt. Sprinkle the spring onion stocks over the rice. Every step in this needs to be cooked on high flame. Pressure cook the chicken, along with salt to taste, turmeric powder and Ginger Garlic paste. Once it is done, remove the bones and keep the boneless chicken pieces aside. We normally don't add water for pressure cooking as chicken will let out water. If you are not making any gravy, you can cook the chicken to make it dry. Heat a pan with oil, add chili paste/ red chili powder, whichever you are going to use. 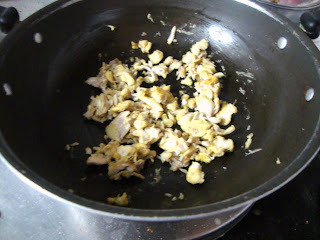 Sauté in the chicken pieces, sprinkle pepper powder and garam masala if you are going to use that. 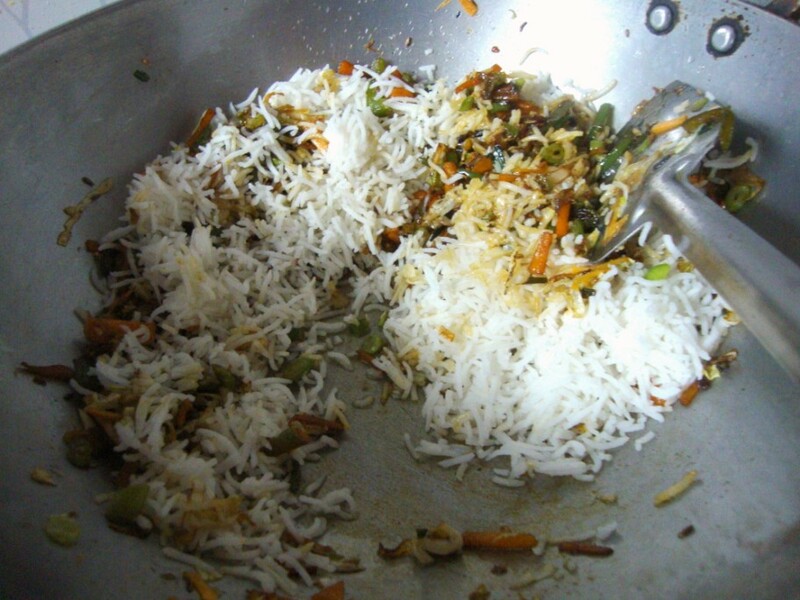 Once it is dry, add the chicken pieces to the rice. If you want to make sure vegetarian eat, make sure you remove a portion and add the rest to the chicken pan.